Recently my daughter's flute was stolen. It was a heavy wall Miyazawa with C# trill and gold-riser headjoint. We are going to replace it with an identical model, which should be fairly easy to find, but my daughter, who is auditioning for performance programs for first year University is considering a gold headjoint or gold flute. She also has recently developed TMJ, and is being treated for headaches with a splint. As a caring father, I wanted to ask an expert, does the weight of a gold flute adversely affect TMJ? Gold flutes, to be perfectly candid, are to my mind, simply a passing fashion. I have an article about gold vs. silver, with links to scientifically run tests where no one can tell gold from silver in blind tests. Rampal and Galway both could not tell which record album they were playing which flute on; both gold and silver sounded the same when recorded, even to the expert player's own ear. If you're going to invest thousands of dollars for precious metals, you'd be smart to spend the money differently. For example, for me, as a professional performer and teacher, I find that in the long run, it's far better to have two moderately priced silver flutes that are almost identical in playability, and that can fit the same top-quality headjoint. I send a flute out for repairs about evern 6-10 months, (this is what the rate of repair is for heavy use of more than 5-6 hours a day practicing) and having two flutes makes the whole ordeal almost effortless. One slighly less expensive flute is my backup (fits my main headjoint which, as it happens, has a gold riser) and this backup flute is used when the primary flute goes for repair. Otherwise it stays in perfect "tweaked up" condition, ready for emergency flute switches if the main flute goes on the fritz right before a performance. This is more of a reality check, that at times you in fact need two flutes if you are a performer with a full performance schedule. As a teacher, I've even had my backup ready for exam or recital times for my top students, who, as they practice more and more prior to a big event, tend to bring on mechanical problems on their student flutes. 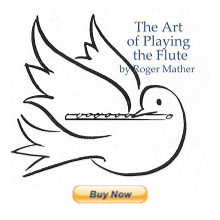 So by all means replace the stolen flute with a good quality moderately priced flute (under $8000), but perhaps consider be practical and save the rest of money you would have spent on gold to purchase needed musical items (a keyboard, a masterclass, a plane ticket to a big flute event), or to pay for repairs or a backup flutes in the future. d) gold may not be the answer to her actual musical needs. e) flute mechanical stability and scale may have future improvements that will make future flutes more desireable. If she doesn't become a performer, one basic good quality flute is sufficient, and a gold riser or gold headjoint can be purchased in the future, if gold still seems to be the answer for her. TMJ is inflamation of the jaw hinge area tissues and is treatable by a dentist or musician's medicine specialist. The weight of the flute (if heavier than normal) can lead to arm/neck/hand problems, but I haven't heard of increased weight of a flute (by several ounces) affecting TMJ. Although I suppose that a heavier flute can cause some discomfort somewhere in the body, compared to a lightweight flute; but I've never heard anything about this in all my reading. Here is an email that I wrote and that orginally appeard on Galway's Flute chat about TMJ and flute playing. What should a flutist with TMJ do? Usually the first thing to do is to visit a good dentist who can assess and possibly correct the bite (file down some small points on certain molars to correct "occlusion"). Only a dental professional can guage the necessary bite corrections to ease the stress on the jaw hinge, and determine absolutely whether dental problems are causing the TMJ. A dentist may also suggest a night-guard if night tooth grinding (bruxism) is a contributing factor. As a flutist who's had TMJ, the next correction after the dentist, and resting the joint that worked for me was finding a deep-tissue massage therapist who specialized in musicians/singers/actors, and who worked on the over-developed jaw muscles to break up habitual tension in those muscles. Alexander Technique may also help. Finally a change in flute embouchure/jaw technique may be warranted if the flutist with TMJ has been thrusting the jaw forward and back to change octave or dynamics. Many flutists accidentally strain the jaw hinge because they don't really know what "jaw forward" means.It can be confusing as it is often mis-explained. Using Kujala's jaw-open/jaw-closed "FULP and PLOT" method is a huge improvement on thrusting the jaw forward and back horizontally. If on the other hand, the flute player's jaw is being thrust forward because they mistakenly use it to counteract left hand index finger pressure against the body of the flute, you may want to change your headjoint alignment to "modified Rockstro". All the best, and let me know how it turns out. Comments on this post from experienced professional teachers and performers are welcome also. Just use the comment button below for your TMJ or gold vs. silver comments. Thanks. I suffered TMJ for a long time and had bad headaches, jaw aches and bruxism. My dentist custom-made a mouthguard for me to wear while I slept, which really helped. This stopped me damaging my teeth further and relived a lot of the pain I used to get. He then referred me to an excellent TMJ physiotherapist in Sydney. I'm now 'normal' again and don't have to wear my mouthguard to bed. Well, unfortunately, (although I don't have TMJ anymore,) I still have bruxism, and have to get my night-guard re-built every month, as I grind it down. I wish you would describe the therapy that stopped your bruxism. I'd like to know what works. Hi, I am surprised by your comment.. both of you. Do you have TMJ? how can it be healed? I have a chronic TMJ for a year now. I played flute 2.5 years ago and I played almost everyday, and started to play saxophone 1.5 years ago, and since TMJ happened ( 1 year ago) I can't play saxophone anymore. and at the same time I have to change my embouchure shape and etc. Do you know what things I can do? since there's no good doctor of TMJ in Indonesia. I already use the splint retainer, and etc, but nothing happened, and it is getting worse. No one knows why this happened. You can cause TMJ by sliding your lower jaw forward. Can you re-position the flute so your lower jaw can hang open then close easily, as it does normally when you talk? I've already adjust to a ideal position now. You said that you've healed from TMJ.. I've surprised cause many people said it can't be healed. My dentist worked to help my TMJ. I didn't have any other therapy so I don't know. Can you ask your dentist who they recommend could help you? Can you explain your dentist treatment? My doctor told me to get laser treatment as well. The dentist tests your bite while marking the teeth with coloured paper that leaves blue marks on your molars where they bite together.The dentist then lightly files down some very small points on certain molars to correct "occlusion" in the bite. The dentist has to have taken courses in TMJ remedies. My advice would be, after consulting a dentist who's an expert in TMJ and ruling out bite-problems, would be to consult a flute teacher who understands how to correct any habits of sliding the jaw forward and back. The jaw should only be opened and closed, not used to slide forward and back. The action of sliding can be the main cause of your TMJ. Heu I have TMJ as well and I have been playing the saxophonw for 7 years now but recently I have been playing fast pieces with much jaw movement. I was diagnosed with TMJ bit am wondering when I can get back to playing as 2 months have passed and my pain is still immense. So how long does it usually take to recover from it? Hi there, not sure how long it takes to recover, but you might have to re-make your embouchure with a relaxed jaw that stays still. That's what I had to do.